As our school year comes to a close, Student Council is handing the reigns to the upcoming seniors. 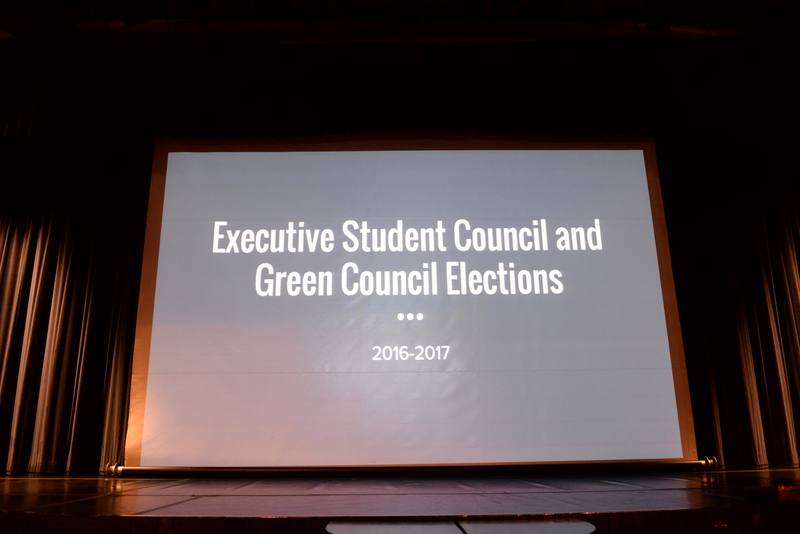 On Tuesday April 12, 2016, candidates for the new Executive Council spoke in front of all of the high school body, proving their skills and leadership to everyone on campus. Student Council is a huge responsibility, providing a bridge between the voice of the students and the administration. Collaboration, professionalism and organization are the main characteristics to be a successful leader and member of the student council. With these guidelines, StuCo is able to efficiently flesh out their events such as SpringFest and Movie and Pizza Nights. The election procedures and positions in office have also been altered to promote collaboration and employ all of the brilliant skills within the council. Firstly, positions in office are now distinctive, specifying the roles and responsibilities of each member. For example, each council is a collective, with a President, Secretary, Treasurer, Spirit Officer and Publicist with equal weight but different roles. During the past elections, students were asked to select their top five candidates, suggesting one person who they deemed best fit for Presidency. This process isn’t just limited to the Executive Council––it is followed by class councils as well, allowing for maximized use of each StuCo member’s talents. Vincent, Cheyenne, Minahil, Radhi and Justin: you are the 2016-2017 Executive Council. Congratulations––you have a long but fulfilling road ahead of you, upon which you must travel carefully. You are all fully capable and have the perfect qualities to lead our school together. For those who didn’t, don’t forget that you have the opportunity to run for class councils, further strengthening the bond between the student body and admin. Readers, know that you are in good hands and if you want to make your school a better place and leave a legacy in our community, contribute to your Student Council.